Even though we may live longer than our grandparents did, we’re exposed to more toxins and chemicals in just 30 days than our grandparents were exposed to in their entire lifestyle! Our lives are more stressful, much of the food we eat is nutritionally-void and loaded with toxic chemicals, the air we breathe is more polluted, our environment is polluted with dirty electricity and EMFs, the water we drink and bathe in is loaded with neurotoxins, heavy metals, chlorine and fluoride, and many people rely on toxic pharmaceutical and OTC drugs. Since 1920, the U.S. production of synthetic chemicals has increased 100-fold. The average American has hundreds of synthetic compounds, toxins and chemicals in their body. These poisonous toxins accumulate in our bodies over the years, which damage our mitochondria, disturb our endocrine, immune and nervous systems, disrupt brain function, liver and organ health, inhibit our ability to lose body fat, and affect how we think, feel and look, and our overall health. Toxins and chemicals are in our blood, urine, organs and tissues. Pre-polluted babies. Mothers pass on toxins through the umbilical cord. Toxic chemicals are in breast milk and in the cord blood of newborn infants. The Environmental Working Group reports that the average newborn baby has nearly 300 known toxins in his or her umbilical cord blood! These are babies who have never been exposed to food, yet their bodies are chemically-overloaded and high in many toxins. Hence, the importance of detoxing, ruling out toxic heavy metals, infections such as Candida overgrowth, bacterial and viral, addressing nutrient deficiencies (and excesses), and optimizing the microbiome and overall health at least one year prior to becoming pregnant for both the mother and father-to-be. A cocktail of chemicals in our environment: Petrochemicals, pesticides, fertilizers, GMOs, glyphosate, fluoride, chlorine, MSG, BPA, plastics, phthalates, flame retardants, xenoestrogens, obesogens, PFOA (Teflon), hand sanitizers, and more! Persistent organic pollutants (POPs): chemical substances that persist in the environment, bioaccumulate through the food web posing a risk of causing adverse effects to human health, animals and the environment. POPs consists of pesticides (such as DDT), industrial chemicals (such as polychlorinated biphenyls, PCBs) and unintentional by-products of industrial processes (such as dioxins and furans). They’re, toxic; they’re persistent, resisting normal processes that break down contaminants; they accumulate in the body fat of people, marine mammals, and other animals and are passed from mother to fetus; and they can travel great distances on wind and water currents. Even small quantities of POPs can wreak havoc in human and animal tissue, causing nervous system damage, immune system dysfunction, reproductive and developmental disorders, and cancers. 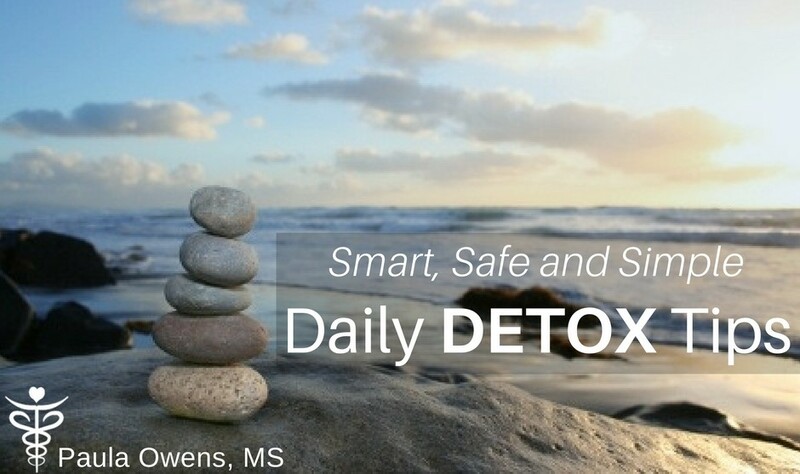 Toxic overload happens when a toxic substance is absorbed at a rate faster than it can be metabolized and detoxified by the body’s detoxification system. We overload our intestines, livers and kidneys with toxins, processed foods loaded with chemicals and preservatives, excess sugar, alcohol, environmental toxins and pollution. Over time, these poisonous toxins and unhealthy habits can trigger a number of problems such as constipation, fatigue, insomnia and consistent awakenings throughout the night, weight loss resistance, headaches, excess visceral fat, memory loss or a lack of mental clarity, diabetes and even cancer (all of which are symptoms of a high toxic load, toxic overload and a sign to make some healthier choices and that you’d benefit from a detox). Toxic overload disrupts hormones, mitochondria and homeostasis, increases belly fat, risk of illness and disease, brain and mood disorders, makes it very difficult to lose body fat, causes autoimmune disease, and impacts how you think, feel, function and look. Detoxification is about resting, cleansing and nourishing the body from the inside out. It’s the normal body process of elimination or neutralizing toxins through the colon, liver, kidneys, lungs, lymph and skin. The #1 detox tip to reduce toxic load (that we have direct control over) is what we choose to eat and drink, and the products we use in our home and on our skin. Non-organic veggies and fruits are heavily sprayed and contaminated with pesticides, herbicides, toxic heavy metals and glyphosate. Factory-farmed animal protein is injected with antibiotics, xenohormones and other poisonous chemicals, and the animals are fed a diet of genetically-modified corn, soy and other garbage. And, I won’t even get into the inhumane, stressful and horrific conditions in which these these animals live and are treated. Processed frankenfoods and fast foods are full of additives, chemicals, GMOs, Round Up ready glyphosate, pesticides, HFCS, trans fats, preservatives, wheat, corn, gluten, soy, artificial sweeteners, mycotoxins and rancid vegetable oils. We drink, shower and bathe in chlorinated and fluoridated water. Exposure to toxins poses a heavy burden on our bodies making us fat, sick, depressed and diseased! Other sources of toxic exposure that accumulate in our bodies over time include smog and pollution from the air we breathe, EMFs and dirty electricity, drinking unfiltered water, mycotoxins, toxic heavy metals, obesogens, and chemicals found in toxic cleaning and personal care products, digestive distress, bacterial, yeast or parasites, and emotional toxins. Are chemicals and toxins making you fat, sick and tired? Optimize your digestion, liver, gallbladder and kidney function with these detox tips, and you’ll naturally support detoxification, reduce inflammation, lose body fat, super-charge your metabolism, alleviate constipation, experience less bloating, fewer aches and pains, healthier-looking skin, sounder sleep and more energy. ♦ Eliminate inflammatory foods. Start by removing artificial sweeteners, soda, sugary beverages, gluten, wheat and high-fructose corn syrup. Then, gradually remove all items containing vegetable oils, soy, sugar, corn, dairy products, table salt, and GMOs, which are the very items making us fat, sick, depressed and miserable. These very items increase toxic load, create serious nutritional deficiencies, leaky gut, digestive dysfunction, inflammation, hormone imbalances, excess cortisol, depression, anxiety and mood disorders, stimulate fat storing hormones spiking insulin, increase risk of type 2 diabetes, cognitive dysfunction, memory loss and many lifestyle diseases. ♦ Stay away from low-fat diets and most cleanses, which can be very stressful to the body, destructive to metabolism, create hormonal disruption, shut down the thyroid, cause nutrient deficiencies, muscle loss, fat storage, and added weight gain once you’re off the diet. The body requires specific nutrients and plenty of protein for the detox process to occur, not starvation, extreme fasting and low-fat diets. ♦ Eat nutrient-dense organic foods! Opt for organic vs conventionally-raised, non-organic foods as much as possible. Eat real food! Reduce pesticide exposure by avoiding the EWGs Dirty Dozen, the 12 most contaminated fruits and vegetables. Always buy these 12 items organic. Avoid farmed salmon and other contaminated frankenfish. Read ingredient labels. Familiarize yourself with these harmful ingredients to avoid at all costs. ♦ Eat a variety of high fiber, chlorophyll-rich leafy greens and plenty of non-starchy vegetables to maximize detoxification. Include plenty of asparagus, cucumber, watercress, artichokes, dandelion, moringa, cruciferous veggies, parsley and cilantro helpful for detoxification, water retention and de-bloating. Chlorella, parsley and cilantro are especially helpful for detoxing heavy metals. Green smoothies are a simple solution to get more fiber and fresh veggies and leafy greens in your diet. ♦ “The solution to pollution is dilution.” Drink plenty of clean, filtered water throughout the day (away from mealtime). Physiologically water works as a catalyst to most functions within the body. Water is important for eliminating toxins, preventing constipation, backaches, headaches, and a required nutrient for brain health and fat loss. ♦ Start your day with this simple and powerful detox beverage. Upon rising, drink an 8-12 ounce glass of water with the juice of a whole fresh lemon or lime to support the liver, create an alkaline environment, stabilize blood sugar and hydrate your body. Add a pinch of unprocessed Celtic sea salt, 1-2 tablespoons of raw, apple cider vinegar, one teaspoon raw organic honey, and a pinch of cinnamon, ginger and cayenne pepper. ♦ Install water filters in your home, especially in the kitchen and bathroom to remove fluoride, chlorine, toxic metals and other chemicals. Drink water from glass and avoid plastic BPA water bottles. ♦ Protein and amino acids are necessary for detoxification. Those who consume a diet deficient in protein have trouble detoxifying environmental toxins and pollutants. Protein helps up-regulate detoxification. Pasture-raised organic animal protein (not factory-farmed conventional protein), bone broth, clean fish and seafood, gelatin and pastured eggs encourage detoxification naturally by supplying sulfur-containing amino acids that support the detoxification pathways. ♦ Drink organic tea. Pau‘d Arco tea, Dandelion tea, organic green tea, Mugwort tea and Yogi DeTox tea. ♦ Raw, organic apple cider vinegar is a powerful detoxifier: Mix 2 tablespoons in an 8 ounce glass of water. Add the juice of a fresh lemon, and a pinch of cayenne, ginger and cinnamon. Consume 10 minutes before meals to optimize digestion and breakdown food. ♦ Identify the underlying cause of toxic load including toxic heavy metals, mold, mycotoxins, Candida overgrowth, parasites, bacterial, yeast and fungal infections, estrogen dominance, and infections in the mouth, and take a step-by-step approach to get rid of these toxins in your home, in your body and your environment. This is crucial! ♦ Blood Tests and Lab Testing. Test to assess, don’t guess! Obtain thorough blood testing, a comprehensive digestive stool analysis, organic acids test, and a toxic metal test to identify nutrient deficiencies or excesses, underlying health issues, toxic load and more! ♦ Optimize kidney and liver function. Foods that are nourishing for the liver include bitter greens like dandelion greens, apples, beets, artichokes, high-sulfur foods (onions, leeks, garlic, egg yolks), cruciferous veggies, parsley, milk thistle and turmeric. Support your kidneys and bladder with adequate hydration (must avoid dehydration), drink dandelion tea, parsley tea and organic cran-water. Use more parsley and cilantro. ♦ Avoid OTC and Rx drugs, including cholesterol-lowering statin drugs, opioids and pain medications, antacids, antibiotics, antidepressants, NSAIDs and Tylenol. Go easy on the booze. Never take Tylenol after drinking alcohol. It’s a deadly combo for your liver and your kidneys. Excessive alcohol consumption disrupts blood sugar and your sleep, causes hormonal imbalances, leaky gut, liver congestion and toxicity, dehydration, increases estrogen load, stimulates appetite, and adds inches to your waistline. ♦ End the cycle of grazing and non-stop snacking all day long. ♦ Digital detox! Minimize electromagnetic field (EMF) exposure. Remove all electrical devices from your sleeping area including your cell phone; avoid using electric blankets and electric heating pads; avoid using your laptop computers on your lap; don’t carrying your smartphone in your pocket, under your bra strap, on your hip or anywhere on your body; stop using the microwave oven; switch out fluorescent light bulbs for incandescent bulbs. If you live near power lines, consider moving. Use salt lamps in your home and office. Take a 24-hour digital detox every week from computers, smartphones and all electronic devices. ♦ Breathe deeper. Practice a minimum of 5 minutes of slow, diaphragmatic breathing daily. Deep breathing supports toxin elimination, reduces stress, minimizes hot flashes, increases energy, composes the mind, improves mood, enhances appearance, increases happiness and positively changes physiology on a cellular level. Yogic breathing helps clear out carbon dioxide from the lung tissue, stimulates the organs of digestion and can, over time, retrain the diaphragm to move freely. ♦ Close up the kitchen by 7 pm. Don’t eat after 7 pm. This is time for your body to rest and detox, not digest food. Eating too close to bedtime can disrupt sleep, create digestive distress, inhibit production of growth hormone, and minimize the detoxification process. ♦ Sleep, rest and relaxation is crucial, especially during any detox process. Keep a regular sleep schedule. Ideally, lights out and in bed by 10pm and awake by 6am. The body repairs physically and psychologically during sleep. This is a time for your body to balance hormones, repair tissues, restore, recover and regenerate. Allow yourself time to rest and relax without feeling guilty. Get a daily dose of sunshine (vitamin D). Indulge in a warm bath with Epsom salts, baking soda and a relaxing essential oil such as lavender. Schedule a massage or sauna – both of these increase the effectiveness of detoxification by releasing toxins from your body. Listen to your gut (intuition) and give your body, mind and soul the love and support it needs. ♦ Ditch toxic cleaning, household and skincare products. We’re exposed to thousands of chemicals every single day, many that we can immediately swap out for more natural, chemical-free options. Switch to more natural cleaning products such as white vinegar and baking soda. Use organic, non-toxic skin care products, shampoo, deodorant, sunscreen and cosmetics void of chemicals and obesogens. Some of my favorites that I personally like include castile soap, Zum laundry soap, Devita Skincare Products and AnnMarie Skincare. Swap out your plastic storage containers and plastic water bottles for glass, ceramic or other eco-friendly materials. Avoid all artificial air fresheners in your home, office and vehicle. Instead use aromatherapy and essential oils. Replace vinyl shower curtains with a cotton shower curtain. Replace Teflon cookware with stainless steel, ceramic or other eco-friendly cookware. Use fluoride-free toothpaste or fluoride-free tooth soap only. Replace your toothbrush every month. Make your own DIY products for your skin, hair, home and body. ♦ Obesogens. Be cognizant of endocrine-disrupting chemicals and avoid them as much as possible. In a typical day we’re exposed to more than 700 hormone-disrupting chemicals in personal care products and cleaning products, food preservatives, and all sorts of plastics. Reduce estrogen dominance. Detailed info on obesogens can also be found in Fat Loss Revolution and The Power of 4. ♦ Keep a food journal. This is especially helpful during a detox. Doing so can help identify trigger foods your body is sensitive to and those that cause fatigue, sleepiness, digestive flare ups and other problems. Another bonus: research shows that those who journal what they eat tend to lose twice as many pounds and make healthier food choices. 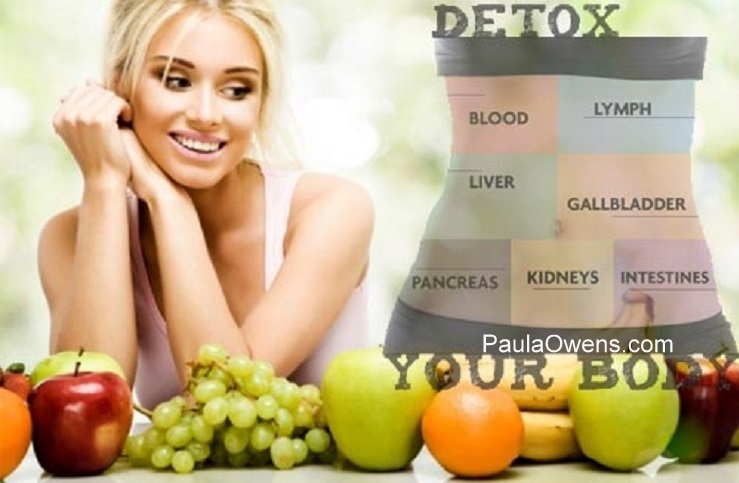 ♦ Your skin is a major organ of detoxification. Dry skin brushing before you shower stimulates your lymphatic, immune and nervous systems, improves circulation, and allows for greater removal of toxins. Spend time in a sauna. Saunas, especially infrared saunas accelerate and encourage the release of heavy metals and chemical toxins. Soak in a tub. Add 1/2 apple cider vinegar, 1/2 cup sea salt, 5-6 cups Epsom salt, 1/2 cup baking soda, 3-4 tablespoons ginger powder and 1/4 cup bentonite clay to pull out toxins. Add a few drops of your favorite essential oil such as frankincense, lavender or sandalwood. ♦ Practice yoga, Qigong and rebounding. Rebounding (bouncing) on a mini trampoline is extremely beneficial for every cell and organ in your body, flushing the lymphatic system and boosting the immune system. Yin-style yoga and various yoga poses including twists, legs up the wall and downward dog naturally encourage detoxification not only physically, but also psychologically, emotionally and mentally. ♦ Lose body fat. Toxins accumulate in fat. Those with higher levels of body fat have a higher toxic load. Losing excess body fat causes fat cells to shrink, which results in the release of fat-soluble toxins. ♦ Get your sweat on with your favorite exercise. Exercise is a natural form of detoxification. Brisk walking, rebounding, sprints, the 10-5-5 workout, the Fat Loss Revolution 12-Week exercise program or any workout you enjoy that cleanses the body of toxins, but don’t overdo it. ♦ Dissolve toxic relationships. Form win-win relationships. Determine who is trustworthy and displays character traits of integrity, honesty and authenticity. Associate with like-minded positive people that support you. Enjoy relationships that nourish your soul and make you feel good. Fat loss, a positive mindset, success and living a healthy lifestyle are contagious; so is negativity, weight gain and unhealthy lifestyles. Pay attention to your environment and who and what you surround yourself with as it greatly impacts your mental, physical, emotional and spiritual well-being. ♦ Clear out the clutter and old stuff in your surroundings (home, office and car), your mind and your body. Create a peaceful environment in your home. De-clutter your home and get rid of old stuff. Have a food funeral! Go through your kitchen and remove food items that are making you fat, sick, toxic and miserable. ♦ Detox your mind. Thoughts are extremely powerful in healing the body, mind and spirit. Nourish your mind with positive thoughts and information. Turn off the news. Minimize time spent with energy vampires and negative people. Generating positive emotions and thoughts is essential to detoxifying your mind. Practice positive affirmations daily. Let go of anything or anyone that pulls or puts you down. Every day list 5 things, people or events you’re grateful for in a gratitude journal. Change your thoughts and you’ll change your life. ♦ High-quality supplements. Detoxification supplement protocols are specific to each and every individual’s biochemistry, environment and lifestyle. Probiotics, magnesium and other minerals, fiber powders, pectasol-C, binders and essential fatty acids are a few basics that play a role in your body’s detoxification process and are helpful for detoxification. Honor the process of detoxification. Whenever dietary changes and these detox tips are introduced, and depending on your toxic load, an individual can experience what is known as ‘healing crisis’ or Herxheimer reaction where they feel worse before better. Symptoms may include frequent bowel movements, headaches, fatigue, skin breakouts, etc. Emotional and mental symptoms often occur as well such as feelings of depression, anxiety, irritability, insomnia or mood swings. This is caused by the body’s natural detoxification process. These symptoms subside in a couple of days. Honor the process, value downtime, get more rest and sleep, and listen to your body. Everyone can benefit from a detox! Start with these Daily Detox Tips! ► Take the Detox Quiz — Download the Detox Questionnaire. Check out the NutriClear Plus, a 15-Day Metabolic Cleanse Detox Program or the 10 Day Detox Program formulated by Abbas Qutab, M.D. These detox programs are easy-to follow, safe and effective! They are designed to address the most common underlying causes of chronic health challenges. No starvation dieting or fasting on the 10-Day Detox or the 15-Day Metabolic Cleanse. Eat real food, eliminate inflammatory foods, support detoxification safely and effectively, and look, feel and function better than ever!